Bacterial growth and division requires a core set of essential proteins, several of which are still of unknown function. They are also attractive targets for the development of new antibiotics. YsxC is a member of a family of GTPases highly conserved across eubacteria with a possible ribosome associated function. Here, we demonstrate by the creation of a conditional lethal mutant that ysxC is apparently essential for growth in S. aureus. To begin to elucidate YsxC function, a translational fusion of YsxC to the CBP-ProteinA tag in the staphylococcal chromosome was made, enabling Tandem Affinity Purification (TAP) of YsxC-interacting partners. These included the ribosomal proteins S2, S10 and L17, as well as the β' subunit of the RNA polymerase. YsxC was then shown to copurify with ribosomes as an accessory protein specifically localizing to the 50 S subunit. YsxC depletion led to a decrease in the presence of mature ribosomes, indicating a role in ribosome assembly and/or stability in S. aureus. In this study we demonstrate that YsxC of S. aureus localizes to the ribosomes, is crucial for ribosomal stability and is apparently essential for the life of S. aureus. Staphylococcus aureus colonises the nares and skin of approximately one-third of the healthy global population  and is responsible for a wide variety of infections both in hospitals and the community [2–4]. The increasing antibiotic resistance of S. aureus has led to the search for alternative drug targets. Amongst them, proteins indispensable for cellular viability are optimal candidates. There are currently about 15 essential proteins from bacterial genomes used as antibiotic targets encompassing a restricted set of microbial processes, including DNA replication and repair, fatty acid and protein biosynthesis, and cell wall synthesis . A large number of essential proteins remain to be investigated for novel antimicrobial development. In a genome-wide study in Bacillus subtilis the IPTG-inducible Pspac conditional expression system was used to determine gene essentiality . A subset of 15 genes identified in this screening had no significant homology to any gene of known function, and included the well-conserved Era/Obg family of GTP binding proteins . The latter belongs to a diverse superfamily of the often referred to as low molecular weight GTPases, which act as molecular switches in the regulation of crucial cellular processes across all domains of life, including: intracellular and membrane signalling, vesicular transport, cell division, chromosome partitioning, protein targeting and ribosomal function . Although very few of the bacterial low molecular weight GTPases have well characterised roles, there is increasing evidence that members of the Era/Obg family of GTPases are involved in ribosome function, assembly or stability. Work on Era, Obg, YjeQ/YloQ, YlqF, YphC, and YsxC in E. coli and B. subtilis has indicated associations of these proteins with ribosomal subunits and changes in ribosomal profiles [8–10]. Ribosome profiles, created by separation of ribosome constituents on a sucrose gradient, show a decrease in whole 70 S ribosomes with an concomitant increase in 30 S and 50 S ribosomal subunits after depletion of the protein of interest [9, 11–15]. YsxC in B. subtilis (YihA in E. coli) is an ortholog of the Era/Obg family of GTP-binding protein that has been reported to be essential in B. subtilis, E. coli, S. pneumoniae, H. influenzae, and M. genitalium[9, 16, 17]. We have previously solved the crystal structure of the B. subtilis YsxC in its open and closed conformations, proven its ability to complex with GDP and GTP, and shown the conformational changes occurring upon nucleotide binding and GTP hydrolysis . A B. subtilis mutant with ysxC under the control of the regulatable Pspank promoter has revealed that depletion of the protein led to the accumulation of intermediate 50 S subunits (described as 44.5 S subunits) different from those seen upon depletion of similar GTPases YphC and YlqF . However, as with YlqF and YphC depletion, intermediates lacked ribosomal proteins L16, L36 and possibly L27. Other putative ribosomal interacting partners of YsxC have been suggested by Wicker-Planquart and co-authors . YsxC is likely to be essential across eubacteria. In this study we demonstrate that YsxC of S. aureus localizes to the ribosomes, is crucial for ribosomal stability and is essential for the life of S. aureus. To test whether ysxC was essential in S. aureus, a strain containing a single chromosomal copy of ysxC under the control of a regulatable promoter (Pspac), repressed by LacI and requiring the inducer IPTG for expression was constructed as indicated in Material and Methods (See also Figure 1). Growth of LC109 (SH1000 Pspac~ysxC/pGL485) at several IPTG concentrations (0 μM, 5 μM, 10 μM and 500 μM) was analysed on BHI agar plates supplemented with chloramphenicol to ensure maintenance of the lacI-containing plasmid (Figure 2A). Strong growth can be seen on the plate containing 500 μM IPTG with distinctive single colonies, which are absent on the plate without IPTG. The phenotype on solid medium was further confirmed in liquid medium (Figure 2B). In a different experiment it was shown that the presence or absence of IPTG does not affect growth of the wild type SH1000 strain (data not shown), while growth of LC109 (SH1000 Pspac~ysxC/pGL485) is IPTG concentration dependent (Figure 2B). No distinguishable alterations were observed on YsxC-depleted cells under light or transmission electron microscopy (data not shown). The number of viable counts on LC109 incubated in the absence of IPTG remained virtually unchanged, while in the presence of 1 mM IPTG it increased by 2 logs. Interestingly, even at 1 mM IPTG, LC109 (SH1000 Pspac~ysxC/pGL485) had a growth defect when compared to the wild type SH1000 strain (2.8×108 and 7.3×109 CFU after 7 h, respectively). These results demonstrate that ysxC is apparently essential for growth of S. aureus in these conditions. Detailed scale representation of the P spac ~ ysxC (LC108/LC109) and ysxC ::TAP-tag (LC103) chromosomal constructs. λred recombination allowed highly specific chimera construction resulting in the Tet-T-Pspac or TAP-tag-kan cassette insertions. The relevant sequence junctions are shown for both constructs. Chromosomal sequence is shown in italics and relevant features generated by λred recombination are underlined. YsxC requirement for S. aureus growth. A) Strain LC109 (SH1000 Pspac~ysxC/pGL485) was grown on BHI agar plates containing 20 μg ml-1 Cam and 500 μM, 10 μM, 5 μM or 0 μM IPTG overnight. B) Exponentially growing cultures of strains SH1000 (●) and LC109 (SH1000 Pspac~ysxC/pGL485) (○,τ,ρ) were washed and resubcultured to approximately 1×106 CFU ml-1 in BHI (●) or in BHI supplemented with 20 μg ml-1 Cam plus different concentration of IPTG: 0 (○), 10 μM (▼) or 1 mM (△). Growth was monitored as CFU/ml. c) Western blot using anti-YsxC polyclonal antibodies. Strains SH1000 and LC109 (SH1000 Pspac~ysxC/pGL485) were grown to an OD600 = 0.5 in BHI and BHI plus 20 μg ml-1 Cam, respectively. Cells were harvested by centrifugation, the membrane protein fraction extracted and samples were separated by 12% (w/v) SDS-PAGE. Lane: 1, the size of molecular weight markers separated on the same gel is indicated; 2, SH1000; 3, LC109. To study if the reduction in growth rate seen using the ysxC conditional lethal strain LC109 (SH1000 Pspac~ysxC/pGL485) correlated with a concomitant depletion of YsxC, protein levels after growth without IPTG were analysed. As indicated above, cells showed a severe growth defect when IPTG was lacking, thus limiting the yield for biochemical analysis. To overcome this, a higher initial inoculum (OD600 = 0.01) was used and cultures were grown with choramphenicol and IPTG (with 500 μM or without). At this inoculum density, without IPTG the growth rate of LC109 (SH1000 Pspac~ysxC/pGL485) was still approximately 1 log below that of SH1000 after 5 hours of growth (data not shown). Equal amounts of material purified by ultracentrifugation were analysed by SDS-PAGE (data not shown) and Western blotting, probing with anti-YsxC polyclonal antibody (See Methods; Figure 2C). In SH1000 there is a major YsxC cross-reactive band of ~26 kD and a minor band of ~25 kD, corresponding to a size similar to the predicted molecular weight, i.e., 23 kD. Both bands show lower intensity in LC109 (SH1000 Pspac~ysxC/pGL485) grown without IPTG. Hence, ysxC downregulation is accompanied by a decrease in YsxC concentration in the cell. One method used to elucidate the function of a protein of interest is to search for protein partners with which it interacts in the cell. In order to identify proteins interacting with YsxC, the protein was TAP-tagged [strain LC103 (SH1000 spa::tet ysxC::TAP)] and an interactive complex purified as described in Materials and Methods. 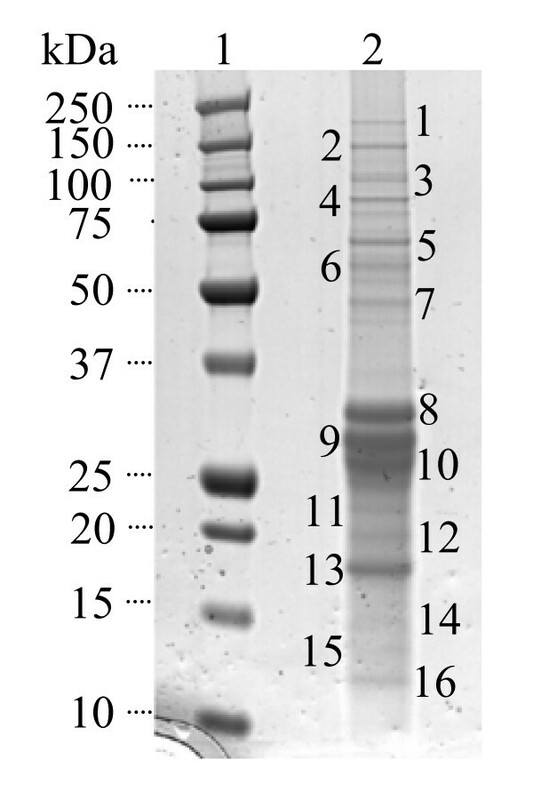 The resulting proteins were separated by SDS PAGE and silver stained (Figure 3). 16 distinctive protein bands found in the eluted YsxC complex were trypsin digested and the amino acid sequence of the resulting fragments determined by mass spectrometry. Subsequently, a MASCOT search for proteins in the database containing these sequences was carried out. Table 1 shows the most probable identity of each of the bands as per its Mowse score. 10 of the 16 bands were identified as proteins from S. aureus, one band was not identified, and four of them (casein and keratin) corresponded to preparation contaminants. Identification of YsxC interacting proteins. Proteins were separated on a 4-12% (w/v) SDS-PAGE gradient gel and silver stained. Lane: 1, molecular mass markers of sizes shown; 2, YsxC complex proteins from 15 l of original culture. The band numbers correspond to those that were analysed by mass spectrometry. 1 Mowse score = -10*Log(P), where P is the probability that the observed match is a random event. The higher the number, the better the match. Individual ions with scores greater than the threshold level (in brackets) indicates identity or extensive homology (p < 0.05). The band that had the highest probability of a match was Band 13. Its Mowse score for 30 S ribosomal protein S5 was 246 with a threshold level of 38. Since 5 fragments from this band matched to this protein the identification is highly probable. Other bands with high match identities were Band 5 (aerobic glycerol-3-phosphate dehydrogenase), Band 8 (30 S ribosomal protein S2), Band 15 (50 S ribosomal protein L17) and Band 16 (30 S ribosomal protein S10) (Table 1). YsxC, the protein originally tagged, was also identified as a high match band (Band 9, 227(36)). All these proteins matched at least 2 fragments from the band. For 2 parent ions with a score of 95% or better, one can assume that the proteins has been identified. Other interacting bands identified with a score indicative of extensive homology (i.e., 36, See Methods) were bands 2 and 7, and corresponded to the DNA-directed RNA polymerase beta' chain protein and putative elongation factor Tu. However, although the former matched 2 fragments, the latter, like SecA and PflB, were one hit matches, which would require further validation to be considered as legitimate YsxC partners. Similarly, Bands 3 and 4 corresponded to casein, a protein not present in S. aureus but a common preparation contaminant. TAP tagging has not previously been reported in S. aureus therefore it was important to eliminate the possibility that any of the proteins identified, corresponded to purification artefacts. An independent purification of an unrelated TAP-tagged protein of S. aureus most likely participating in phospholipid metabolism and also purifying with the membrane fraction was carried out (YneS/PlsY; García-Lara and Foster, unpublished). It revealed interactions with proteins also encountered in our search for YsxC partners: 30 S ribosomal protein S5, elongation factor Tu and aerobic glycerol-3-phosphate dehydrogenase (data not shown). Although these data do not exclude the corresponding proteins as legitimate interacting partners of YsxC and YneS/PlsY, the involvement of these two proteins in different aspects of bacterial physiology suggests the common partners as likely artefacts of the purification procedure. Overall, the protein partners resulting from our experiments suggest YsxC as a ribosome-interacting protein. The TAP tagging experiment identified several ribosome-associated proteins as YsxC interacting partners. To examine the putative association of YsxC with ribosomes, a co-purification experiment was carried out. Staphylococcal ribosomes were extracted from other cellular materials by several ultracentrifugation and washing steps, and core ribosomes were depleted of accessory ribosomal proteins by ammonium chloride extraction. Equivalent samples from different stages of the purification process were separated by SDS-PAGE, Western blotted and immuno-detected with anti-YsxC antibodies (Figure 4). YsxC is in the insoluble fraction following the initial ultracentrifugation of a total cell extract (lane 3) and remains in the insoluble fraction after solubilisation of the membranes with Triton X-100 (lane 5). When this insoluble fraction was resuspended in 1 M NH4Cl, YsxC was solubilised (lane 6). These results suggest that YsxC is associated with the ribosome but is not a core ribosomal protein. Subcellular localisation of YsxC. The ribosome-containing fraction of S. aureus SH1000 was made by ultracentrifugation after cell breakage and removal of cellular debris. Lane: 1, pre-stained molecular mass markers; 2, supernatant after ultracentrifugation; 3, pellet resuspended in buffer, containing 0.5% (v/v) Triton X-100, equal to that of the original suspension; 4, supernatant after the ultracentrifugation step was repeated; 5, pellet resuspended in buffer containing 1 M ammonium chloride (NH4Cl); 6, supernatant after further ultracentrifugation; 7, pellet resuspended in an equal amount of buffer containing 1 M NH4Cl. Samples were resolved by 12% (w/v) SDS-PAGE and A) Coomassie Blue stained, or B) Western blotted with antibodies against YsxC. Each lane contains the equivalent of 1 ml of original culture. In order to elucidate the nature of the YsxC-ribosome association, material from S. aureus SH1000 containing ribosomes was separated by ultracentrifugation in a sucrose gradient. This separates the ribosome into its constituents, i.e., 30 S and 50 S subunits, as well as the whole 70 S ribosome. The association of YsxC with a particular ribosomal fraction was determined by Western blot immunodetection with anti-YsxC antibodies. As shown in Figure 5 the extract contained the three expected ribosomal fractions and YsxC was primarily located in samples 8-14 corresponding to the 50 S subunit. Association of YsxC with ribosomal subunits. A) A260 of a ribosome containing fraction of S. aureus SH1000 separated by a 10-30% (w/v) sucrose gradient centrifugation. 1 ml samples were taken and analysed for RNA content (A260). B) Western blot of gradient samples probed with anti-YsxC. YsxC may play a role in ribosome assembly, activity or stability. Ribosome profiles of wild type and YsxC-depleted cultures were compared. Cells from both cultures were broken in the presence of two different buffers: Ribosome (associating) buffer and S (dissociating) buffer. Ribosome buffer gives conditions where tightly coupled ribosomes will remain intact whereas loosely coupled ribosomes will dissociate into subunits (; Figure 6A, C). In S buffer, the magnesium levels are reduced and the monovalent ions increased which leads to full dissociation of the ribosomes (; Figure 6B, D). After breakage, samples were ultracentrifuged and the pellet containing the ribosomes resuspended and loaded onto 10-30% (w/v) sucrose gradients in the relevant buffer and centrifuged. 1 ml samples were taken from the base of the gradient and tested for RNA levels (Figure 6). Role of YsxC in ribosomal profile determination. Sucrose gradient profiles were established for extracts from SH1000 (A, B) and LC109 (SH1000 Pspac~ysxC/pGL485) grown with no IPTG (C, D). 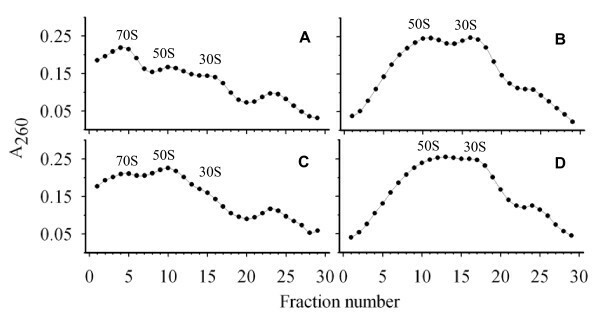 10-30% (w/v) sucrose gradients were run in either associating (A, C) or dissociating (B, D) buffers and ribosomes analysed by A260 levels in gradient samples. The ribosome profile of the YsxC-depleted strain (LC109 grown in the absence of IPTG) in associating buffer (Figure 6C) shows a change in ratio of subunits (50 S and 30 S) to whole (70 S) ribosomes when compared to wild type (Figure 6A). The 30 S and 50 S peaks in the depleted strain were larger than that of the 70 S. In contrast, the wild type profile reveals a much larger peak for the whole ribosome than for either of the two subunits. When the ribosome is fully dissociated into its constituent subunits (in S buffer) the levels in wild type and LC109 (SH1000 Pspac~ysxC/pGL485) are virtually identical (Figure 6B, D). However, the peak for the 50 S subunits is slightly broader than in the wild type potentially indicating the presence of aberrant 50 S subunits. Conditional lethal constructs based on the replacement of the cognate promoters of chromosomal genes by promoters that can be exogenously controlled have been used successfully to identify essential genes in several organisms. For instance, the Pspac promoter was used in the comprehensive genome wide study of B. subtilis, where ysxC was proven to be indispensable . Identification of essential genes in S. aureus has also taken advantage of this system and a number of them have been identified including genes involved in cell wall biosynthesis [21, 22], a glycoprotease  and a two-component system . In this study, we have engineered the chromosomal copy of S. aureus ysxC under the control of Pspac. 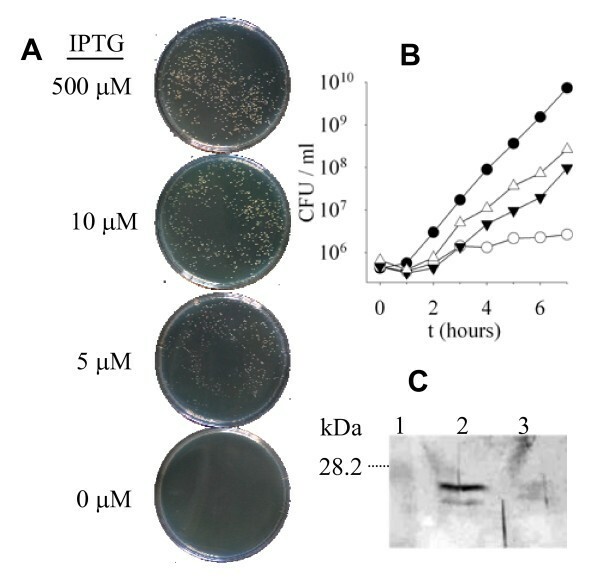 Growth of LC109 (SH1000 Pspac~ysxC/pGL485) depended on the presence of the inducer IPTG in the medium, thereby proving that ysxC is apparently essential in S. aureus. Our results are in agreement with data from an antisense study by Forsyth and co-workers suggesting the essentiality of ysxC in S. aureus. In the absence of inducer, the strain is unable to form single colonies on plate and only residual growth is detected in liquid medium. The latter is most likely due to the YsxC remaining in the cell at the time of inducer removal and/or the minor leaky nature of Pspac also observed in the Pspank expression of ysxC by Schaefer and co-workers . Interestingly, even maximum IPTG concentrations are unable to restore the growth rate of the mutant to the SH1000 wild type values. Thus, YsxC could potentially be an interesting target for novel drug development. Galperin and Koonin cite YsxC in the top 10 list of 'known unknowns' of highly attractive targets for experimental study of conserved hypothetical proteins in S. aureus. Nevertheless, it is extremely important to verify essentiality and analyse gene function in relevant pathogens as not all genes essential in one species maybe so in another. Tandem affinity purification was originally developed in yeast  and has been extensively used in other organisms [28–31], however, not previously in S. aureus. TAP tagging of YsxC and subsequent purification indicated interactions with a number of proteins, the majority of which had functions related to or were integral parts of the ribosome. These were 30 S ribosomal proteins S2 and S10, and 50 S ribosomal protein L17. This indicates that the function of YsxC is likely to be related to the ribosome. However, the ribosome is a complex structure and a large number of processes are required for its correct function, including the construction of subunits from ribosomal proteins and RNA and the assembly of the subunits into the whole ribosome before the translation process. Much of the exact details of these processes and which additional factors are required are unknown. S2 and S10 are not located together on the assembled ribosome but involved in the later stages of 30 S assembly . In contrast, 50 S ribosomal protein L17, which is localized on the surface of the subunit, binds to 23S rRNA, and even after extensive treatment to dissociate proteins can be found in the core of the 50 S subunit [33–35]. Importantly, B. subtilis L17 over-expression in E. coli results in abnormal cell division and nucleoid segregation becoming ultimately lethal . Similarly, in B. subtilis, a mutation altering L17 was reported to cause temperature sensitivity and a sporulation defect . Interestingly, depletion of YsxC in B. subtilis results in cell elongation, abnormal cell curvature and nucleoid condensation . Similarly, depletion of YihA in E. coli also impairs cell division . Importantly, deficiency of other small molecular weight GTPases in various species, including ObgE in E. coli, and Bex in B. subtilis also appear to affect cytokinesis and chromosome partitioning [39, 40]. Whether these phenotypes are due to the absence of YsxC (and/or L17) or other P-loop GTPases directly impinging on the cell division-related apparatus or a downstream pleiotropic effect remains to be studied. Our light and transmission electron microscopy studies of the cellular morphology of S. aureus YsxC-depleted cultures did not reveal a conspicuous deviation from that wild type cells (data not shown). Recent reports based on the ribosomal intermediates accumulated following YsxC depletion or Far-Western blotting analysis of purified ribosomal proteins have suggested other YsxC interacting partners in E. coli and/or B. subtilis. A few are essential for viability (L6, L7/L12, L10, L23, and perhaps L16) while others, although required for optimal growth, are dispensable (L1, L27 and L36) [9, 10]. The L7/L12 stalk (which binds L10 at its base) has been suggested to participate in 23S RNA binding and on the recruitment of peripheral ribosomal factors . Structural studies on the topology of several proteins including L7/12, L1, L6 and S5 has led to postulate a role for them as RNA binders probably stabilizing rRNA tertiary structure by fixing the positions of pairs of rRNA sequences . The possible YsxC contribution to, RNA stabilization remains to be determined. Although the bulk of L7/L12 resides within the 50 S region, evidence of its interaction with the 30 S subunit, including S2 has been provided by cross-linking studies (See Review ). In addition, immuno-EM observations provide supportive evidence for different locations within the ribosome for the L7/L12 carboxy-terminal end including the 30 S subunit. It is also worth noting that most of the proteins shown to interact with YsxC are well exposed on the surface of the E. coli ribosome: S1 (which requires S2 for binding to the 30 S subunit), S5, L7/L12, L10, L17 . Thus providing clues as to the location of YsxC within the ribosome. Butland and co-authors found YihA (the E. coli YsxC homolog) to associate with itself . In our study such interaction would not be detectable as only the tagged copy of the ysxC was present in the chromosome. However, our experimental design enabled us to confirm that the YsxC-TAP-tag protein was functional, excluding the possibility of inactive protein artefacts. The interaction we have observed between YsxC and the β' subunit of RNA polymerase, has also been previously reported for ObgE [14, 28]. Further work needs to be done to first confirm this interaction in S. aureus and then establish whether it relates to ribosomal or extra-ribosomal functions as reported for L24 of B. subtilis. P-loop GTPases, such as YsxC, show an association mainly with one or other subunit of the ribosome. For instance, Era and YjeQ with the 30 S subunit [46, 47], and Obg, YlqF and YphC with the 50 S subunit [9, 13, 48]. We have shown here that YsxC also associates with the 50 S subunit, a similar behaviour to its ortholog in B. subtilis. Since our co-fractionation experiments revealed the interaction of YsxC with proteins from the small and large ribosome subunits, its absence from the 30 S fraction could be due to lower affinity and/or stability of YsxC towards its partners in that subunit. The specific role of YsxC and other P-loop GTPases in the assembly or stability of the 50 S subunit remains to be determined. After YsxC depletion, the amount of 70 S ribosome decreases with concomitant subunit increase. This could be due to an error in the assembly of the subunits themselves or their assembly into the whole ribosome. As the levels of individual subunits after full dissociation stays approximately the same between wild type and YsxC depleted cells it is possible that the subunits are not being fully assembled. This was observed in B. subtilis where depletion of YsxC results in a number of proteins missing from the 50 S subunit, ultimately resulting in the accumulation of aberrant large subunits . It has been reported by these authors that YsxC in B. subtilis binds the 44.5 S preribosomal particle. The depletion conditions used to enable the harvesting of sufficient biomass for ribosomal extraction required some growth of the culture, prior to cessation, which could have partially masked the presence of distinctive intermediates. YsxC could also act at the level of ribosomal stability; once the ribosome is assembled it may require transient external proteins for stabilization, as it has been postulated for Era . This could explain the interaction of ObgE, one of the P-loop GTPases, with both of the ribosomal subunits observed by Sato and co-workers in E. coli. The dual interaction could be mediated by the presence of ribosomal constitutents modulating YsxC GTPase activity, by GTPases activating proteins (GAPs) or guanine exchange factors (GEFs) , or the intracellular guanine pool . However, additional evidence of ObgE association with the small ribosomal particle is needed since other authors have only reported the co-fractionation of Obg homologs with the 50 S fraction in E. coli and other species [48, 52, 53]. In this article we have successfully used conditional lethal genetic constructs and implemented Tandem Affinity Purification technology in S. aureus to show that YsxC in S. aureus is an apparently essential protein that associates with the large ribosomal subunit and plays a role in ribosomal assembly or ribosomal stability. Ribosomal components have been a proven target for successful antibiotics, the elucidation of the role of additional essential and highly conserved ribosomal proteins such as YsxC would open a new avenue to the discovery of novel antimicrobial drugs. Strains and plasmids are listed in Table 2. E. coli was grown in Luria-Bertani (LB) medium and S. aureus in BHI (Oxoid). Growth was carried out at 37°C, with shaking at 250 rpm for liquid media. To verify essentiality, cultures were inoculated to OD600~0.0001. When required, antibiotics were added at the following concentrations: ampicillin (Amp), 100 mg l-1; chloramphenicol (Cam), 20 mg l-1; erythromycin (Ery), 5 mg l-1; lincomycin (Lin), 25 mg l-1; kanamycin (Kan), 50 mg l-1 and neomycin (Neo), 50 mg l-1; tetracycline (Tet), 5 mg l-1. Selection of S. aureus strains containing the ery or kan genes was made on Ery/Lin and Kan/Neo, respectively. The S. aureus NCTC8325 (SH1000 parental strain) gene homolog of the B. subtilis ysxC is SAOUHSC0177. Oligonucleotide primers used are listed in Table 3 and a map of the final chromosomal construct is shown in Figure 1A. pELC6 was created by cloning the Tet-T-Pspac cassette from pGL400 into a vector containing the ysxC gene region from S. aureus SH1000 (pGL411). pGL400 was constructed in a 3-way ligation reaction into the HindIII site of pOB  of the following PCR-amplified fragments: a) the tet resistance gene from plasmid pDG1513  (670 bp fragment; primers: 5'GLUSh6B1 and 3'GLUSh6B); and, b) a 2236 bp fragment (primers: 5'GLUSh6A1 and 3'GLUSh6A) from pMUTIN  containing the t0t1t2 transcriptional terminators, the Pspac promoter and the oid regulatory region. pGL411 is a pOB derivative containing the S. aureus ysxC region including 1397 bp upstream and 1354 bp downstream of this gene which was produced using primers 5'GLUSh3I and 3'GLUSh3I. The Tet-T-Pspac cassette was amplified from pGL400 using primers 5'GLUSh16H and 3'GLUSh16H and inserted upstream of ysxC in pGL411 (strain E. coli GL1299) by λred recombination . The resulting plasmid was named pELC6. Purified pELC6 was electroporated into S. aureus RN4220  to create, by suicidal recombination, an intermediate strain (LC107) containing two copies of ysxC: a wild type and a Pspac~ysxC. Using φ11 phage transduction  from LC107 into SH1000 the resident ysxC gene in SH1000 was replaced by a single copy of ysxC under the control of Pspac by selecting for transductants resistant to tetracycline and sensitive to erythromycin. The resulting strain was named LC108 (SH1000 Pspac~ysxC). Replacement was confirmed by Southern blot analysis (results not shown). A multicopy plasmid containing lacI was constructed (pGL485) and transduced into LC108 to generate LC109 (SH1000 Pspac~ysxC/pGL485). pGL485 is a pMJ8426  derivative where the tetracycline resistance gene between the ClaI and SalI sites has been replaced by the chloramphenicol acetyl transferase gene (cat) from pSK5630 . The latter fragment was obtained by PCR amplification using primers, 5'GLUSh103A and 3'GLUSh103A. 2 italics indicate the fragment of the oligonucleotide designed for λred recombination, whilst non-italics indicate the portion of the primer designed to amplify the insert; blackboxes indicate the location of the RBS and the START of ysxC in the complementary strand (5'GLUSh16H) or the 3' end of the ysxC sequence (3'GLUSh65B). A plasmid containing the TAP-tag cassette (pGL433) linked to kanamycin resistance was constructed as follows. Two PCR-amplified fragments (ReadyMix ABgene) were ligated together at the NotI site: a) a fragment from pBS1479  containing the Calmodulin Binding Protein (CBP)/Protein A tag (TAP-tag cassette) ; and, b) the kanamycin resistance gene from Streptococcus faecalis (kan) present in plasmid pMAL7 . The resulting TAP-tag-kan cassette fragment was cloned in the A-overhang site of pCRII TOPO (Invitrogen) to give pGL433. The TAP-tag-kan cassette was PCR-amplified from pGL433 and inserted into pGL411 (in strain E. coli GL1299) by λ red recombination as a TAP-tag translational fusion to ysxC (plasmid pELC1). The resulting ysxC::TAP-tag-kan fragment was flanked by the chromosomal upstream (1397 bp) and downstream (1354 bp) regions surrounding ysxC present in pGL411. pELC1 was electroporated into S. aureus RN4220, which generated by single cross-over suicidal recombination a strain with two copies of ysxC, one wild type and one TAP-tagged, LC101. A strain was constructed with the Protein A-encoding gene (spa) deleted. S. aureus 8325-4 spa::tet was lysed with φ 11 and the spa mutation transduced into SH1000 to give LC102 (SH1000 spa::tet). Resolution of the two copies of ysxC in LC101 into only a ysxC::TAP-tagged copy was achieved by ρ 11-mediated transduction  of a LC101 lysate into LC102. Transductants resistant to kanamycin (ysxC::TAP-tag) and tetracycline (spa::tet) but sensitive to erythromycin (antibiotic marker linked to the wild type copy of ysxC in pELC1) would have only ysxC~TAP-tag in a spa-background, LC103 (SH1000 spa::tet ysxC::TAP-tag-kan). This strain was verified by Southern blot analysis (results not shown). Figure 1B shows the final chromosomal insertion, with the relevant DNA junction sequence. Cultures of LC103 were grown in BHI to mid-exponential phase (OD600~3.0), placed immediately onto ice slurry for 10 min, harvested by centrifugation (6,000 rpm, 10 min, 4°C, Jouan CR3i rotor AC50.10), frozen in liquid nitrogen and stored at -80°C. Subsequently, a cell extract was obtained from cells broken with a Braun homogeniser. The fraction containing membranes and ribosomes was isolated by centrifugation at 50,000 rpm for 2.5 h in a Beckman 70.1 Ti rotor. This fraction was subsequently purified using a method based on that previously reported by Puig et al. (2001) . All binding and elution steps were performed in 0.8 × 4 cm Poly-prep columns (Bio-Rad). 200 μl of IgG-Sepharose bead suspension (Amersham Biosciences) was transferred into the column and the beads were washed with 10 ml IPP150 (10 mM Tris-HCl pH 8.0, 150 mM NaCl, 0.1% v/v Nonidet NP-40). 10 ml of extract in IPP150, corresponding to 2.5 l of original culture, was transferred into the column, sealed and rotated for 4 h at 4°C to allow binding of Protein A to the resin. Multiple purifications were run in parallel to increase protein yield. Elution to remove unbound protein was performed by gravity flow washing the beads three times with 10 ml IPP150 supplemented with Nonidet (NP40) at a final concentration of 1.5% (v/v). Protein A-bound complexes were excised from the resin by TEV protease cleavage, performed by addition of 1 ml of TEV cleavage buffer and 100 units of AcTEV protease (Invitrogen). The beads were rotated for 16 h at 4°C. The TEV cleavage eluate containing the protein complex CBP-YsxC -protein partners was recovered by gravity flow and 1 ml was mixed with 3 ml of Calmodulin Binding Buffer (10 mM Tris-HCl pH 8.0, 10 mM 2-mercaptoethanol, 150 mM NaCl, 1 mM magnesium acetate, 1 mM imidazole, 2 mM CaCl2, 0.1% v/v Nonidet NP-40) and 3 μl 1 M CaCl2. The resulting solution was applied to a column containing 200 μl of Calmodulin-Sepharose beads (Stratagene) that had been washed with 10 ml of Calmodulin Binding Buffer. The column was then rotated for 1 h at 4°C. Elution was performed by gravity flow and the beads washed three times with 10 ml Calmodulin Binding Buffer. The bound proteins were eluted with Calmodulin Elution Buffer (10 mM Tris-HCl pH 8.0, 10 mM 2-mercaptoethanol, 150 mM NaCl, 1 mM magnesium acetate, 1 mM imidazole, 2 mM EGTA, 0.1% v/v Nonidet NP-40) in 10×200 μl fractions. 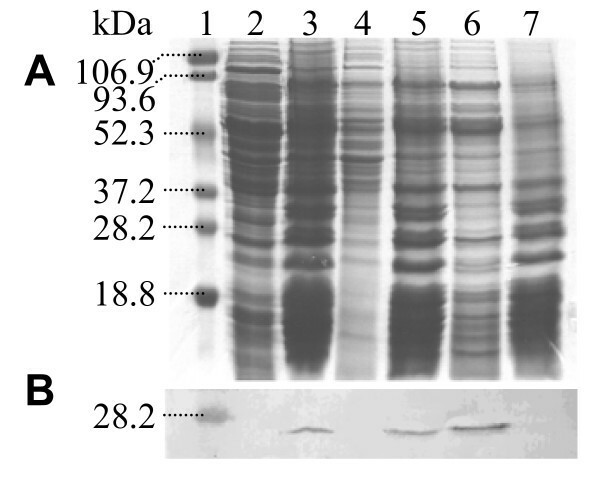 Proteins purifed as described from the equivalent of 15 l of original culture were TCA precipitated and separated using a gradient of 4-12% (w/v) SDS-PAGE and silver stained. Two independent and equivalent experiments were undertaken Distinctive bands were in-gel tryptic digested, and prepared for positive-ion MALDI mass spectra (Applied Byosystems 4700 Proteomics Analyzer), MS spectra were acquired, and the strongest peaks with a signal to noise greater than 40 were selected for CID-MS/MS analysis (Technology Facility, University of York). Mass spectral data were submitted to database searching using the MASCOT program (Matrix Science Ltd.) The Mowse scoring algorithm uses empirically determined factors to assign a statistical weight to each individual peptide match. The threshold level indicates that a match is significant if it would be expected to occur at random with a frequency of less than 5%. Therefore, individual ions with scores greater than the calculated threshold level indicate identity or extensive homology. S. aureus SH1000 (2 l culture) was grown to an OD600~3 and immediately transferred to an ice slurry for 10 min. Cells were harvested (6,000 rpm, 10 min, 4°C), broken using a Braun homogeniser, and the membrane/ribosome fraction purified by ultracentrifugation at 50,000 rpm for 2.5 h in a 70.1 Ti rotor (Beckman). The resulting pellet was resuspended in 7 ml of 0.01 M Tris-HCl pH 8.2, 14 mM magnesium acetate, 60 mM potassium acetate, 1 mM DTT containing 0.5% (v/v) Triton X-100 to solubilise membranes. The ultracentrifugation step was repeated and the pellet resuspended in 6 ml of the above buffer containing 1 M NH4Cl. The sample was ultracentrifuged again and the resulting pellet was resuspended in 5 ml of the above buffer. A His(6)tagged version of YsxC was constructed by cloning the ysxC gene PCR-amplified from S. aureus SH1000 (using primers 5'elc4 and 3'elc4, and ReadyMix, ABgene) into the 3'-dA overhang site of the overexpression vector pETBlue-1 AccepTor vector (Novagen). The resulting plasmid (pELC4) was subsequently electroporated into E. coli TunerTM (DE3) pLacI (Novagen). Cells were grown in LB 50 μg ml-1 Amp on a rotary shaker (250 rpm) at 37°C to an OD600 = 0.5. Then expression was induced by the addition of 0.5 mM IPTG and further incubation undertaken for 3 hrs. Cells were harvested by centrifugation at 5,500 rpm for 10 min (Jouan CR3i rotor AC50.10), and the pellet was stored at -20°C. The pellet was resuspended in 20 ml of Buffer C (50 mM Tris-HCl pH 8.0). 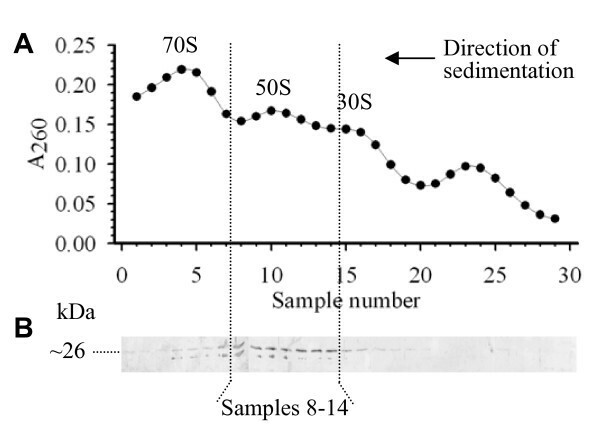 Cells were disrupted by sonication (Sanyo MSE Soniprep 150; 16 micron amplitude, 2 × 20 sec treatments). Inclusion bodies were recovered by centrifugation at 10,000 rpm in a Beckman JA-20 rotor for 10 min and were subsequently washed three times via resuspension in 10 ml of buffer C, 10 ml buffer C plus 1 M NaCl, and 10 ml buffer C, and centrifugation. Each time pellets were suspended in the buffer and then collected by centrifugation at 10,000 rpm for 5 min (Beckman JA-20 rotor). Washed inclusion bodies were suspended in 20 ml of buffer C plus 8 M Urea, left to dissolve for 20 min with stirring and then remaining insoluble material was removed by centrifugation in a Beckman JA-20 rotor at 19,000 rpm for 15 min at 4°C. The sample was applied on a 12 ml Ni-column (iminodiacetic acid as a chelator immobilized on Sepharose 6B FF, Sigma). The column was washed with 25 ml of 8 M Urea in buffer C, then with 25 ml 8 M urea in 50 mM 2-(N-morpholino)ethane sulphonic acid (MES)/NaOH buffer pH 6.3 and finally with 25 ml of 8 M Urea in 50 mM sodium acetate buffer pH 4.6. The pH 6.3 wash contained the recombinant protein and was concentrated using a VivaSpin concentrator 100000 MWCO (Viva Science). Samples were applied on a Hi-Load Superdex 200 16 × 60 cm (Amersham) equilibrated with 6 M Urea in buffer C. Proteins were eluted from the column in the same buffer and 2 ml fractions were collected and analysed for protein content. The resulting protein was dialysed against PBS. 1 mg of the purified protein was then used for production of polyclonal antibodies against YsxC (Antibody Resource Centre, University of Sheffield). SH1000 and LC109 (SH1000 Pspac~ysxC/pGL485) inoculated to an starting OD600~0.01 and grown to an OD600~0.5 in BHI and BHI plus 20 μg ml-1 Cam, respectively. Growth of LC109 in the absence of IPTG results in noticeable but partial YsxC depletion. After breakage with a Braun homogeniser, cell extracts were centrifuged at 50,000 rpm for 2.5 h in a Beckman 70.1 Ti rotor at 4°C. The supernatant was removed and the pellet resuspended in 2 ml of either S buffer  or Ribosome buffer . Both buffers were supplemented with protease inhibitors (Complete, Roche; 1 tablet in 25 ml and added at a 1:25 dilution to the reaction mixture). 30 ml 10-30% (w/v) sucrose gradients were formed using a Hoefer gradient maker. Samples corresponding to 2 l of original culture were layered on top of the gradient and centrifuged at 19,000 rpm for 16 h at 4°C in a Beckman SW28 rotor. 1 ml fractions were removed from the base of the gradient and RNA levels were assayed by diluting each sample 1:100 in Tris-HCl pH 7.8 and measuring absorbance at 260 nm. Elizabeth L Cooper, Jorge García-Lara contributed equally to this work. We would like to thank Chia Y. Lee for kindly providing plasmid pMJ8426. TAP plasmid pSB1479 was obtained from Euroscarf http://web.uni-frankfurt.de/fb15/mikro/euroscarf/ord_tpla.html. This work was supported by the Biotechnology and Biological Sciences Research Council (United Kingdom). ELC, JGL and SJF contributed in the design of the study and in the writing of the manuscript. ELC and JGL carried out the genetic constructs necessary for the work and the determinations of ysxC essentiality. ELC performed the purification of YsxC partners, its subcellular localization, and its association with the ribosome. All authors read and approved manuscript.